Serenity Now: A Giveaway and a Party, Still Going Strong! I hope your weekend is going smoothly! I kind of, sort of, slept in until 8:15 this morning. The girls were playing (albeit very, very loudly) in their room, but for some reason they decided not to come to their door and call "Mooooommmmmy, we're huuuuuuungry" until 8:15. So, there you have it. Right now, I am sipping a frappucino and catching up on some Weekend Bloggy Reading. Natalie has a birthday party to attend at noon, and I'm hoping Michaela Byrd and I can head across town and browse Borders. If you have entered the Willow House Giveaway yet, head over pronto! Carmella is offering a $40 Gift Certificate to her online shop for one lucky reader. Lots of eye candy in that post! 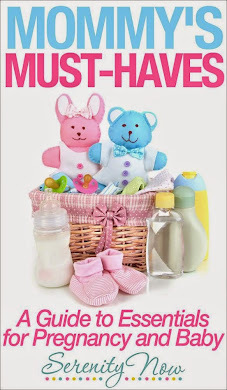 You can earn an extra, automatic entry in the Giveaway by linking up (with a valid link!) 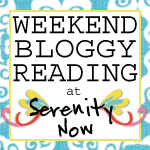 to my Weekend Bloggy Reading party with your best post of the week. I love having a neat variety of posts from across Blogland to read over the weekend...lots of fun! Here's the button code if you'd prefer to use that in your post rather than a text link-back. Sounds like a wonderful day, Amanda! Enjoy! Sounds great! I'm finally catching up on my blog reading - your site looks so bright and pretty too which is a bonus!